Used granite curbs waiting to be repurposed. A common use for granite, often overlooked, is for street curbing. Not usually seen in the western and central U.S., granite curbing predates the use of cast concrete, the most commonly used material. Although initially more expensive than cast concrete, granite lasts many times longer. Granite curbs don’t wear out. And even when they are removed in order to reconfigure a street or some other reason, the used curbing is in high demand for use as stone steps, decks, pathways, or other landscaping features. Among industry experts, granite curbing is superior to cast concrete in strength, abrasive resistance, durability, cost of maintenance, reusability, and aesthetics. Although granite is the best choice for virtually every curbing application, over the past 25 years there has been a significant increase in the use of cast concrete curbing due entirely to an assumption that granite curbing is expensive relative to concrete. Based on research studies the facts are clear that granite is the superior choice when long-term costs of maintenance, repair, and disposal or resetting expenses are calculated along with initial costs. It’s for this reason that street curbs in Washington D.C. are made of granite instead of cast concrete. There are plenty of things to gripe about when it comes to the federal government. But at least they made the right choice when it came to curbs. It’s not just money or longevity that justifies the use of granite. Stone just looks better. Washington D.C.’s street curbs should be as stately as the rest of its grand exterior. 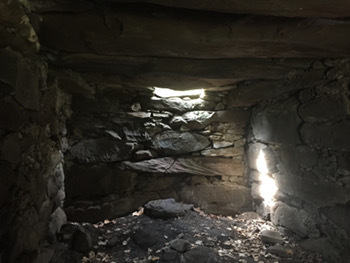 A local mystery: Who built this stone chamber, and why? About a thirty minute drive from the October Country Inn, and after navigating a particular route through the tangled web of Vermont back roads, stands a leaf covered mound in the forest covering most of what may be a 2,000 year old stone structure. Similar structures are found throughout the east coast and beyond. Fifty-two stone chambers have been found in Vermont alone. The majority of these stone chambers, as with this one, are found on upland valley slopes, ridges or hilltops facing the south or southeast. 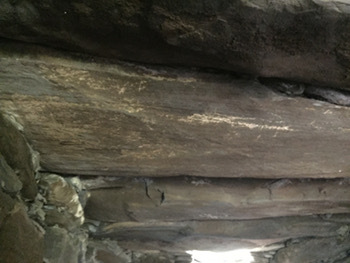 Slabs of stone used to form the roof. The origin of these stone chambers is far from settled. 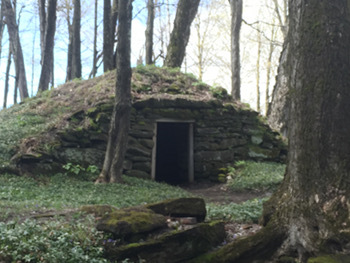 A study done in 1950 by Vermont state archeologist Giovanna Neudorfer concluded that these structures were root cellars made by early Vermont settlers. However, more recent archeological opinions do not share such a definitive conclusion. For one thing, the roofs and other structural members of these chambers are composed of massive slabs of stone weighing many tons. Although it may not have been impossible for an early settler to split and move such stones into place, why would they? There are much simpler methods to construct a root cellar. View of the inside looking toward the back wall. Most interestingly, however, is that the winter solstice sun rises in the center of this chamber’s entranceway when viewed from inside. These chambers are also often found in association with other stone features, platforms, walls, and cairns whose alignments correspond to specific celestial events. Their use may have been a kind of prehistoric calendar. Backdating with modern computer astronomical simulations to determine when a particular chamber would have existed in order to be in alignment with a important celestial event, dates these chambers to about 2,000 ago. It has been suggested that these chambers are of ancient Phoenician or Celtic origin. Who knows? Maybe. Why don’t you visit this chamber, look around, and decide for yourself. First visit the October Country Inn. We’ll tell you how to find it. View from the farmhouse porch. When in Vermont, there are endless reasons to choose October Country Inn for your lodging needs. One of them is that we are really close to Woodstock’s Billings Farm and Museum. A visit to Billings Farm is a visit to Vermont’s rural heritage. Find out first-hand how they did things on the farm during the 1800′s. 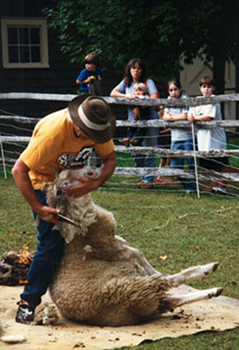 Get to know their Jerseys, sheep, horses, and oxen through interactive programs and activities. Explore the barns and calf nursery and watch the afternoon milking of the herd. Visitors experience a first-hand sampling of actual farm work, animals, and agricultural processes. The authentically restored 1890 farm house, the center of the farm and forestry operation a century ago – features the farm manager’s office, family living quarters – and creamery, where butter was produced for market. Interactive programs interpret 19th century agricultural improvement, butter production, and domestic life. Exhibits housed in 19th century barns depict the annual cycle of rural life and work, as well as the cultural values of Vermont farm families a century ago. Vermont was a sheep state before it was a dairy state. Through much of the 19th century, sheep dominated the livestock outnumbering both cows and people. Now, since it’s Spring, it’s time to sheer Billings Farm’s Southdown sheep and turn their wool into yarn. 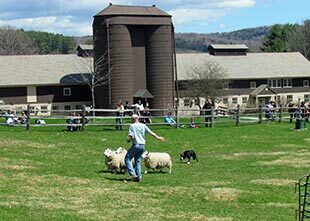 Accordingly, on Saturday and Sunday May 7 and 8, Billings Farm & Museum will feature sheep shearing & herding with Border Collies. Watch the Border Collies round up the sheep herd for the spring shearing. Accompanying wool craft activities such as spinning and carding demonstrations will highlight the skills needed to turn fleece into yarn. Southdown sheep are known for their high quality meat and excellent fleece, averaging between four and five pounds of fleece apiece. This particular breed is known to be very blocky, resembling a rectangular box with feet. Southdowns tend to be docile and friendly, with strong mothering instincts. The farm keeps between six and ten breeding ewes and each spring the ewes give birth to a lively group of lambs. And the light pushed back the darkness. The October Country Inn was recently certified “Greenleader Gold,” by Trip Advisor for our energy conservation practices. A substantial element of our conservation practices is to use energy-efficient lighting throughout the inn. We first replaced all the many incandescent light bulbs with the more efficient flourescent variety, leaving a box full of incandescent bulbs in the basement. Most recently we revisited this bulb switching strategy by replacing all the flourescent bulbs with the even more energy-efficient LED variety. Now we also have a box full of flourescent bulbs in the basement alongside the box of incandescent bulbs. The box of replaced incandescent bulbs next to the box of replaced flourescent bulbs. Speaking of light, regardless of how energy-efficient our lighting may be, a nighttime thunder-storm will roll through every once in a while and blow down a few trees taking out a power line somewhere, and we are thrown into darkness like it was the middle ages. Out come the candles. Candles have been around since about 3000 BC, however, where they were once the go-to form of artificial light, they only serve an interim purpose when electricity is unavailable to provide quick access to light in order to collect and fire up the slightly more practical wick burning lamps. In the eighteenth century, Edie’s Vermont ancestors would have used wick lamps burning whale oil (which may well have also come from Edie’s whale hunting ancestors). Compared to candles, whale oil produced a superior whiter, brighter light. But then they began to run out of whales. The price of whale oil went way up, and cheaper carboniferous fuels from coal and petroleum emerged. By the 1850s kerosene replaced whale oil as the lamp fuel of choice in the Woodstock area. The next big thing in indoor lighting was fueled by gas that was piped into homes and businesses from coal-fired gas generating stations like Woodstock’s Gas Light Company set up in 1855. Gas light was cheap and led to a high incidence of night illumination in the cities and towns of the area. It was also a bit dangerous and led to many structure fires as well as gas plant explosions. Of course, just like today, when gas supplies (or electrical supplies) are interrupted, out come the candles and lamps. In some ways, when you need to push back the darkness, not much has changed. 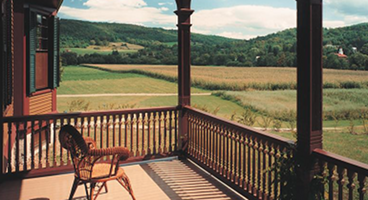 The October Country Inn provides hospitality and lodging to residents of other states and countries that travel to Vermont for the opportunity to experience and enjoy the unique set of activities and attractions this unusual state has to offer. It is no accident that Vermont has managed to retain so much of its rural character and natural beauty. A lot of credit for Vermont’s conservation ethic stems from the work of Vermont native George Perkins Marsh (1801-1882). Marsh, born in nearby Woodstock, wrote Man and Nature in 1864. He is being honored for this seminal publication by the Marsh-Billings-Rockefeller National Historical Park, Billings Farm & Museum, and the Woodstock Foundation with a November 21 and 22 two-day event entitled Landscapes of Hope: Celebrating the 150th Anniversary of Man and Nature. Born in the brick building housing the National Historic Park that incorporates his name, Marsh spent his early life in a Vermont that was covered with natural forests. Through his personal involvement with clearing lands, and manufacturing and dealing in lumber, he had occasion to both observe and feel the effects of an injudicious system of managing woodlands and products of the forest. Educated at Dartmouth College, Marsh had many careers. He was a lawyer, newspaper editor, sheep farmer, mill owner, lecturer, politician, and diplomat. Marsh was elected to Congress in 1842 where he was greatly influenced by John Quincy Adams whose foresight and ideas of government’s role in natural resource preservation and management anticipated those of Theodore Roosevelt. In Man and Nature, Marsh was the first to raise concerns about the destructive impact of human activities on the environment. No one before him had ever turned to the study of the earth as the home of humankind. Woodstock’s two-day celebration of Man and Nature will explore the impact of Marsh’s work to inspire and engage those who continue the legacy of caring for the land and the communities that it supports. Following a 5:30 reception and book signing on Friday, November 21, at the Billings Farm Visitor Center in Woodstock, keynote speaker David Lowenthal (author of George Perkins Marsh: Prophet of Conservation) will give a talk at 6:00 entitled, Man and Nature at 150: Past, Present and Future, followed by a panel discussion with land-ethic leaders. (RSVP: jo_anne_dolan@nps.gov). On Saturday, November 22, Conservation Conversations, a dialogue of hope and inspiration for stewardship will be held from 9:00 a.m. to 12:00 at the Billings Farm Visitors Center followed by an afternoon of guided hikes and programs exploring the birthplace of George Perkins Marsh and stewardship in practice. Woodstock patron Mary French Rockefeller’s roots run deep. An unassuming turnout on the east side of Route 106, a few miles south of Woodstock, is home to a headstone like monument and history marker of uncommon interest. Called “Indian Stones,” a couple of carved slate tablets tell the story of the 1754 capture of a local family by indians, and marks the spot where Susannah Johnson gave birth to the great-great grandmother of Woodstock native Mary French Rockefeller. But these tablets don’t tell the whole story. In the 1750s, James and Susannah Johnson lived at the edge of the frontier alongside the Connecticut River in the town of Charlestown, New Hampshire. Marking the start of the French Indian War, on August 30, 1754, the entire Johnson family, James, Susannah, and their 3 children were captured by an Abenaki war party and force marched to Canada to be sold to the French. The next day, Susannah, who was nine months pregnant, went into labor and gave birth to a daughter upon a flat rock in a nearby strembed. She was named Elizabeth Captive Johnson. One hundred and fifty-six years later, in 1910, Mary French Rockefeller, the granddaughter of Frederick Billings, was born in Woodstock. It is well-known that the town of Woodstock and its rural surroundings have greatly benefitted from the patronage of Laurance Rockefeller. This is in no small part due to Mary French’s influence. Laurance said that his interest in Woodstock flowed simply from the fact that it was Mary’s home. Indeed, Woodstock was very definitely Mary’s home. Having spent her childhood living on her grandfather’s Woodstock farm, and roaming through the forests of Mount Tom on her pony, her love of Vermont’s rural nature was as much due to her childhood experience as to her direct connection to the land forged by the earlier birth in a nearby streambed of her great-great grandmother Elizabeth Captive Johnson. Because it was Mary’s home, Rockefeller adopted Woodstock. He saw the dangers unwise development could pose for Woodstock and worked to guide development so that landscape and townscape were considered together. With this in mind he purchased and replaced the aging Woodstock Inn, greatly improved the country club and ski area. He also funded the underground routing of electrical and telephone wires throughout the village, greatly enhancing Woodstock present historical and aesthetic appearance. Covered bridges near Woodstock, Vermont–one in a series. The Lincoln covered bridge near Woodstock, Vermont. Covered bridges are remnants of the 19th Century, like pets, all have names because most are unique. These bridges were covered to protect the bridge itself from the elements, namely, Vermont winters. The cover part was an easily replaced enclosure providing protection for the much more difficult to replace structural members and roadbed. Vermont has the greatest concentration of covered bridges in the U.S.–a total of 114. Most are still in use. One hundred years ago, there were over 600 covered bridges in the state. After the flood of 1927, only 200 were left standing. Nearly half of these 200 have since been lost to fire, development, or floods. Pratt arch truss structure visible inside the bridge. The Lincoln covered bridge, located in Woodstock, just off Route 4, is only about 3 miles from the October Country Inn. Many more covered bridges can be found within an hour’s drive of Inn. The Lincoln covered bridge is 136 feet long and spans a section of the Ottauquechee River. It was built-in 1865 by R.W and B.H. Pinney. This is the only bridge in the U.S. where the builders used the complex wood and metal arch patented by T. Willis Pratt 33 years earlier. A Pratt arch truss includes vertical members and diagonals that slope down toward the center. The interior metal diagonals are under tension under balanced loading and vertical elements under compression. Legacy of stone–a study of the art and industry of the Yankee farmer. OCI’s barnyard retaining wall is a study in the art and industry of the Yankee farmer. It has been said that stone walls are Vermont’s signature landform. More to the point, Vermont writer Castle Freeman Jr. writes, “… if a stone wall a fraction as long as the walls of Vermont alone had been built by the order of some old king or emperor, it would be one of the wonders of the world.” The reason why so many stones were stacked into walls throughout Vermont is because when the glaciers were formed in centuries past, they trapped many rocks within them. When the glaciers later receded, they left millions of tons of rocks behind. When it became necessary to replace the original cellar steps, these irreplaceable slabs of stone were recycled, and now proudly form the portal to OCI’s lawn and gardens. Throughout the centuries, many early Vermont farmers would find that their farmland would have many stones on it that weren’t there previously. Before a farmer plowed a farm, there were probably few rocks scattered throughout the farm. When a farm is plowed however, it causes layers of soil beneath the surface to push up their rocks from the underlying soil layers. This problem was especially evident in Vermont because of its rocky and stone filled soil. Many farmers would have to remove the rocks on their farm if they wanted to plow it again, only to find that they would have to repeat the process of removing stones, again and again. It’s like they were growing stones. Consequently, field stone became an abundant natural building material that found its way into the foundations, water wells, and the retaining and boundary walls that are scattered throughout Vermont to this day. The meticulous detail of a Vermont farmer’s stonework, displayed in a section of OCI’s barnyard retaining wall, lives for centuries beyond his years. Every day we are reminded of this legacy of stone because of the October Country Inn’s Vermont hill farm heritage. From the stacked stone foundation that still supports the inn’s old farmhouse core, to the artful construction of the barnyard’s retaining wall, to the stone lined hand-dug well out back, meandering around the property can easily become a trip back through time. Many questions come to mind. Just look at the detail and incredible precision with how the stones are set in the barnyard’s retraining wall. In order for such a retaining wall to do its job, the width at the base of the wall must be as wide as the wall is high, tapering in width at the wall rises in height. That’s an awful lot of rock to move around. We live in the midst of this past work that is so easy to take for granted. These stone works are cultural resources left behind by the people who once lived here, in the same spot where we now live. We are humbled by their legacy of stone. We will not take it for granted.